Love and rockets: Matrimonio interplanetario | A Marriage in the Moon (IT 1910) | Silents, Please! We all have problems in our lives, and in our relationships. But what if the one you love literally lives on a different planet? This is the problem facing the couple in Matrimonio Interplanetario, a charming Italian short film in the Méliès mould. 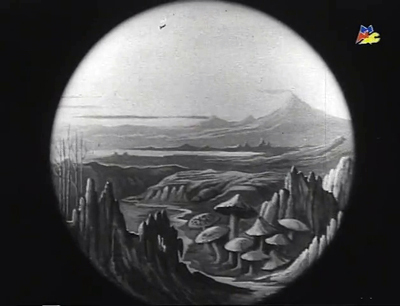 The film opens with Aldovin exploring the surface of Mars via his telescope: we see that it is picturesquely sculptured, and that mushrooms are plentiful. But not, however, as interesting as what he spies in zooming in on a Martian settlement! Not only is there life on Mars, it’s life that Aldovin finds very attractive – he is instantly head-over-heels for the Martian Yala. Yala and her father Fur, a Martian astronomer, look back through their telescope, and Yala too is very taken with Aldovin. Aldovin gets very excited and gesticulates wildly, calling on his polka-dotted friend to share his discovery and joy. 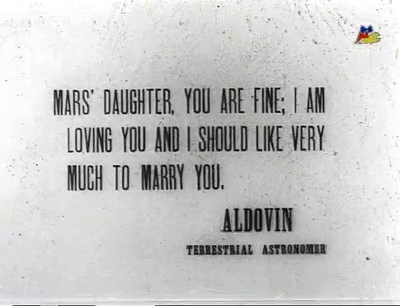 Aldovin receives back a message from Fur: “If you want to marry my daughter, come in a year to the moon.” So he busies himself building a cannon-propelled rocket in which he will journey to Luna. On Mars, Fur and his daughter also make preparations. Eventually, the two meet on the moon! Things are briefly fraught when some moon-monsters surround them, but Aldovin scares them off and the two enter wedded life; a bunch of moon-dancers celebrate with them. Twinkling stars are at times furrowed by deep blue from the rapid passage of distant fiery planets rolling over the infinite ether. Saturn, the Andromeda and Orion nebulas, all of the constellations, pass over the screen in a beautiful series. Matrimonio Interplanetario was directed by Enrico Novelli (pseudonym: Yambo), who two years earlier had published a science fiction novel, La colonia lunare | the Lunar Colony, which was a source of inspiration for this film. For those who read Italian, scholar Denis Lotti of the University of Padua has written an essay that explores the relationship between this book and the film, particularly the chapter I promessi sposi lunari | The Lunar Betrothal. An interesting point that Lotti makes is, that while Interplanetario matrimonio is far from being a Futurist work, some aspects of the film can be connected to the concepts idealized by the Futurists; he mentions the alphabet animation of the wireless transmission in relation to the Futurists’ ideas about the deconstruction of language. It’s a landmark in Italian silent film history as well as an endearing film in which love conquers distance. Happy Valentine’s Day, everyone! Matrimonio interplanetario [UK: A Marriage in the Moon]. Dir. Yambo [Enrico Novelli]. Rome, Italy: Latium-Film, 1910. This film is preserved by the Cineteca del Museo Nazionale del Cinema in Turin, Italy, and is available to view here on their Vimeo channel. This entry was posted in Film and tagged cinema of 1910, cinema of Italy, Enrico Novelli (Yambo), Museo Nazionale del Cinema, science fiction. Bookmark the permalink. Great post! This was made in 1910? Wow! It was! 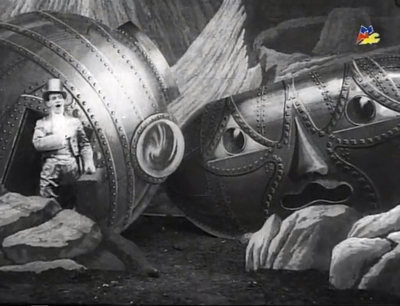 If you don’t already know it, you might also like to have a look at the restored version of Le voyage dans la lune – the colouring is just amazing. The US film industry was definitely innovating right from the beginning, but the European industry was so huge and dynamic during this period, it’s fascinating to me. This looks wonderful – thank you for bringing it to my attention. Love the still of the moving letters, such creativity in 1910! Despite living in London and regularly complaining about the dominance of Hollywood her and in Europe I very rarely watch anything that isn’t a US production – this points out just what I’ve been missing. The wireless transmission shot of the moving letters was my favourite part of the film – very visually smart, I thought! There’s so much of film history I have yet to discover, too. And I do love Hollywood, even if I don’t write about it very much here. Rewatched Whatever Happened to Baby Jane? yesterday – god I love that film.